Do you recognize this blue door, with yours truly so humbly posed before it? 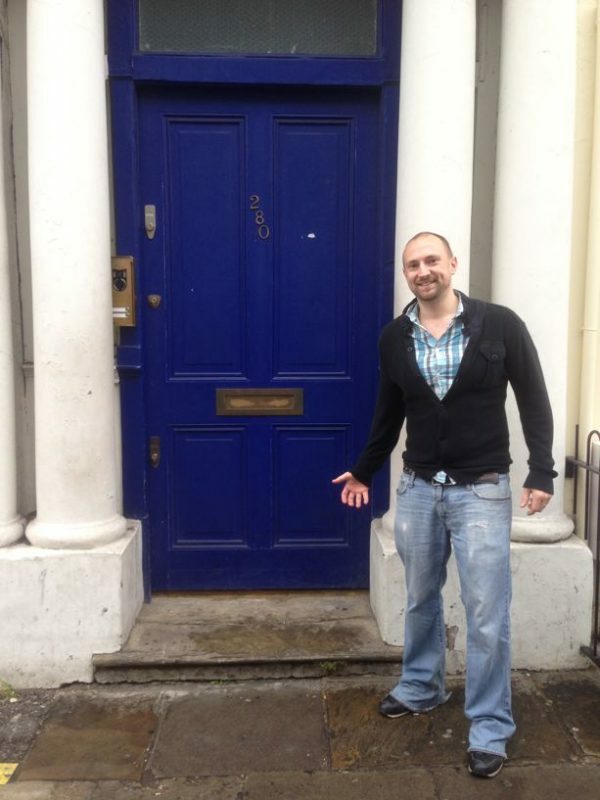 That’s right, it is the fabled Blue Door from the movie Notting Hill! Here is Hugh Grant running over to it in the title sequence of Notting Hill. Of course it is not as blue now as it once was. Maybe this still is the only shot where we see Hugh actually in shot with the blue door. There are plenty of Spike, of course, standing there in his underpants posing for the papparazzi, but none of Hugh. We went to Notting Hill two weeks back to meet up with one of SY’s co-workers and family in a cool cafe/restaurant for a late lunch. Apparently they’ve seen Daniel Craig in there before. It’s very central and hip, and exceedingly expensive to live. Her friend’s husband took us on a Notting Hill tour after lunch- the blue door, the Travel Book Shop, the spot where Will spilled OJ on Julia. I know this movie very well- after using it as an extensive reading text for one of my classes back in Japan for a couple of years. For a whole term they’d read the graded reader version of the movie (also written by Richard Curtis), answering questions I’d prepared, then at the end at Christmas we’d watch the movie. In the second term it was Love Actually. Apparently (according to my guide) Richard Curtis owned this house at the time of the movie. He since sold it.